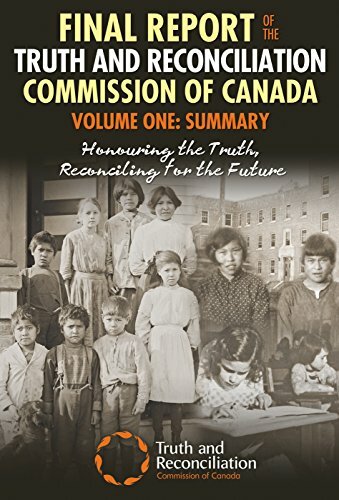 In the spirit of the TRC Reading Challenge (#ReadTheTRCReport) the following are my notes on the the Truth and Reconciliation of Canada’s Final Report: Honouring the Truth, Reconciling for the Future. The goal is to incite more people to read the report and to generate productive, ongoing conversation. Obviously, these notes are not comprehensive and they reflect my own research interests and biases (for instance, in digital media and the politics of forgiveness). Comments, thoughts, and criticisms are welcome. A HUGE part of this final report is about Canada adopting and implementing the United Nations Declaration on the Rights of Indigenous Peoples (UNDRIP). (137, 146, 153, 187-191). The Commission is convinced that a refusal to respect the rights and remedies in the Declaration will serve to further aggravate the legacy of residential schools, and will constitute a barrier to progress towards reconciliation” (137). -Under UNDRIP, self-determination is the key indicator of reconciliation (187). -With UNDRIP there is a possibility of transitional justice, insofar as with it there is an actual chance to shift out of colonial policy. This report really skips over the details of Laforme’s resignation. Cyberspace: 93,350 views of TRC events from at least 62 different countries (31). “Without truth, justice, and healing, there can be no genuine reconciliation” (12). “reconciliation offers a new way of living together” (22). Aboriginal people and the state have very different views on what reconciliation is (187). Elder Fred Kelly on the danger of the TRC as a template (195). “Reconciliation is all about respect” (236). Reconciliation, forgiveness, and healing conflated (17, 18). “Reconciliation is not just an apology but a two-way path of apology and forgiveness” (311). Reconciliation and the neighbour (301, 310); “the work of reconciliation is work for neighbours” (308). “The schools were part of the colonization and conversion of Aboriginal people, and were intended to bring civilization and salvation to their children. These were the rationales that were used to justify making the lives of so many children unhappy” (43). -the model for residential schools came from the industrial schools in Europe and North America, which were used to educate the urban poor (57).